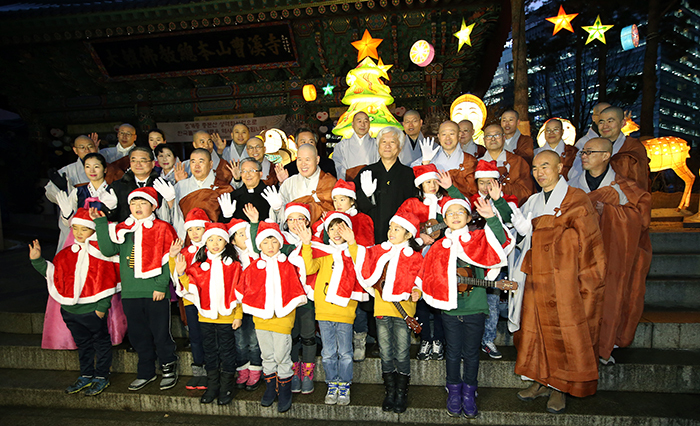 Buddhist monks and a children’s choir pose for a photo during a lighting ceremony for a Christmas tree at Jogyesa Temple in Jongno-gu, Seoul, on December 17. On December 17, the lights of a Christmas tree at the Iljumun, the main gate to Jogyesa Temple, were switched on, emitting an array of colorful lights for the season. 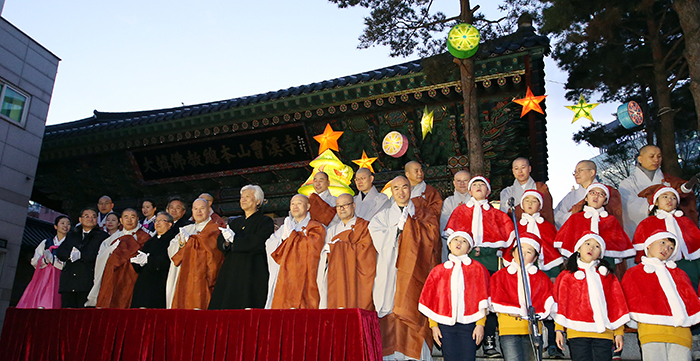 With Christmas Eve just a week away, the Jogye Order of Korean Buddhism held its Christmas-tree lighting ceremony at its main temple. “Let us celebrate the birth of Jesus Christ, whose name is sacrifice and love,” said the Venerable Jaseung, head of the Jogye Order. 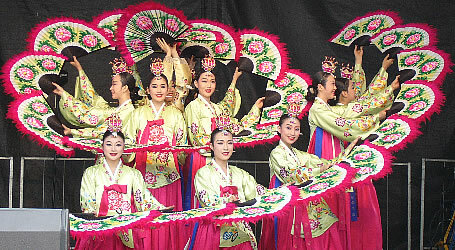 Members of a children’s choir call out, 'Merry Christmas,' and wave to the audience in front of a lit Christmas tree at the main gate to Jogyesa Temple on December 17. The switch-on ceremony was attended by General Secretary Kim Young-ju of the National Council of Churches in Korea and the Most Reverend Hyginus Kim Hee-joong of the Catholic Bishops’ Conference of Korea, as well as monks from the Jogye Order. During the ceremony, a children’s choir from the temple sang Christmas carols, celebrating the birth of Jesus. “I am so thankful to all of you for celebrating the birth of Jesus together with us by illuminating the temple with lights on a Christmas tree,” said the Most Rev. Kim Hee-joong. Since 2010, the lighting ceremony at the temple has been held every Christmas as a symbol of harmony between different religions in Korea and showing a true Christmas spirit. A Christmas tree is switched on in front of the Iljumun, the main gate to Jogyesa Temple, as a symbol of unified religions, on December 17. 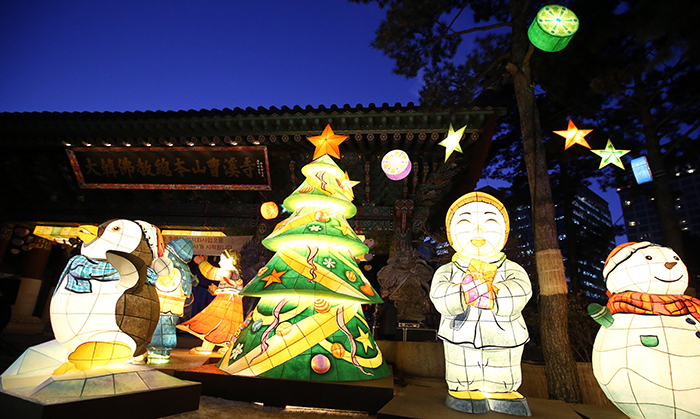 Next to the tree are large lanterns in different shapes, including a smiling child monk, a snowman and a penguin. 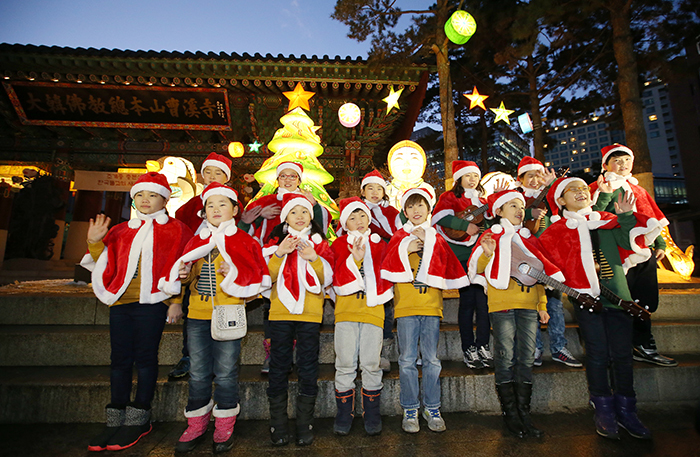 Representatives from different religions and a children’s choir sing Christmas carols during the lighting ceremony for a Christmas tree at Jogyesa Temple in Seoul on December 17.